When I was pregnant with Andy, I was sick for about two months. Everything made me want to puke so I was plastered to the couch for most of the day. Barry either cooked or brought dinner home. It was not a fun two months for the type of person that really enjoys being in her kitchen – it’s my happy place…give me a list and give me my kitchen. But then I started to feel better, so I immediately thought, “watch out, smoke detector kitchen, here I come!” I got it into my mind that I was going to make this Creamy Chicken Spaghetti from Pioneer Woman. And I’m not gonna lie – even now I look at it and shudder. Well, Miss Smarty Pants thought that she would use ground chicken instead of the chopped chicken it called for in the recipe. Bad move, y’all. Bad move. By the time I was done making this dish, the smell of the cooking ground chicken, the creamy sauce, and the chopped mushrooms had pushed me to the limit. Then I thought I would try to eat it, because apparently I had lost my ever-loving mind. Bad move, y’all…BAAAAADDDD move. For about 12 months after that, I could STILL get sick just thinking about that meal. And even right now I’m about to make myself yak. Moving on! After all that mess, I just recently have been able to eat ground chicken again. My mom made some awesome meatballs with it, and I realized I could eat that – I’m still not eager to try another creamy dish with it. *Shudder* Ground turkey and I are still on the rocks…even though I didn’t use ground turkey for that experiment – it’s still the same color. Mind association, you know. Moving on! 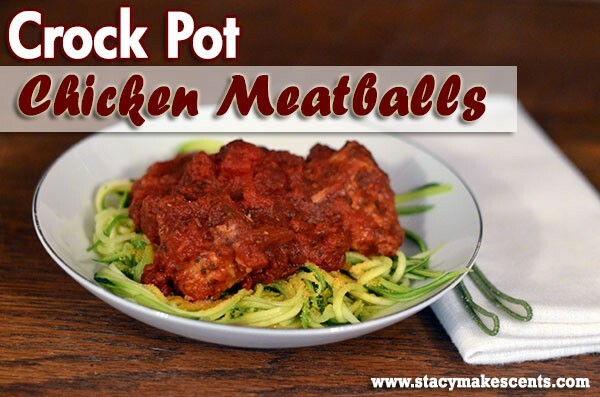 I made these chicken meatballs in the crock with some yummy marinara sauce…and they hit the spot because I have a deep-seated love of meatballs of all shapes, sizes, and meats. Cooking them in the crock just combines two of my loves. For this, I used dehydrated onion and garlic. I always keep this on hand…especially the garlic. I can’t keep fresh garlic around here – for some reason, I always forget it and then it ends up getting moldy in the fridge. 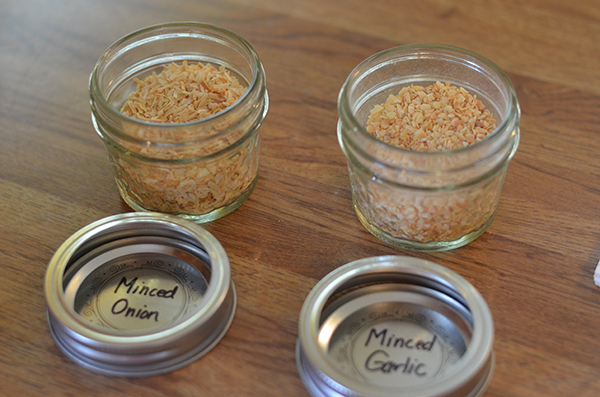 So, this dehydrated garlic is always saving my behind. I also used these tomatoes because I like them. Crushed Tomatoes with Basil. Do you have to use this exact brand? No. I’m not brand loyal for the most part. SHOW ME THE MONEY!!!! Why is my can all dirty, you ask? Well, that would be because one day something exploded in my canning room. We’ll just leave it at that. Ahem. 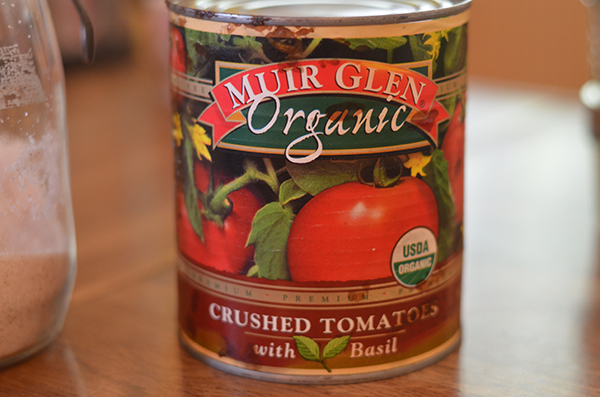 If you chose to use plain crushed tomatoes, just add some extra basil to your recipe. But don’t leave it out…I just looooooooooooooooooooooooooove the basil in this dish. So, here’s the thing. Meatballs made with MEAT are easy to roll. Meatballs made with poultry are NOT. I kinda just make “plops” instead of “meatballs.” But I couldn’t call the dish Chicken Plops in Marinara – that wouldn’t get pinned…and chicken plops sounds like a way to say chicken poop. Does my mind work like anyone else’s? Anyway, just get them into the crock. Roll or plop. Or get lazy and pat it down in there like a meatloaf…I ain’t hatin’. Your house is gonna smell like downtown Italy all day. I just realized that Italy is a country and not a city, so it doesn’t really have a downtown…but I like how it sounds, so I’m gonna leave it. Your meatballs might stick together a little bit, but they’ll break apart as you spoon them out. Or as you stand with a spoon and eat them straight from the crock. I ain’t hatin’. I like this served over Zoodles (zucchini) or Squoodles (squash). Try adding “oodles” to the end of your food…it’s fun. I’m on a vegetable noodle kick, so I’m trying to noodelize everything. I’m trying to waffelize everything too. Try adding “ize” to the end of all your words. It’s fun. Oh my gosh. SQUOODLEIZE!!!! Combine chicken, minced garlic and onion, salt, basil, egg white, oats, and Parmesan in a bowl. Mix together – using hands is easiest. 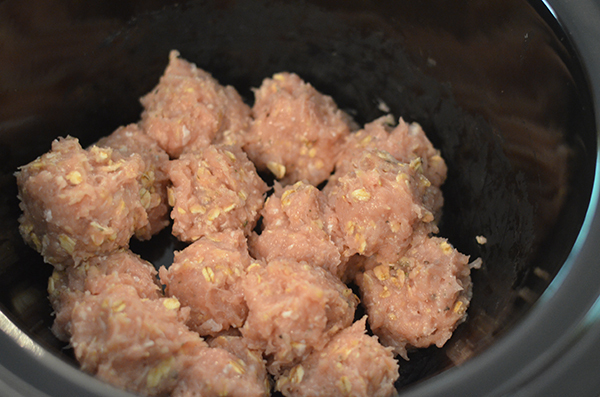 Form into 12 meatballs and put into bottom of slow cooker (I use my 4 quart for 1 pound meat). In a bowl, combine tomatoes, garlic powder, Italian seasoning, and pepper. 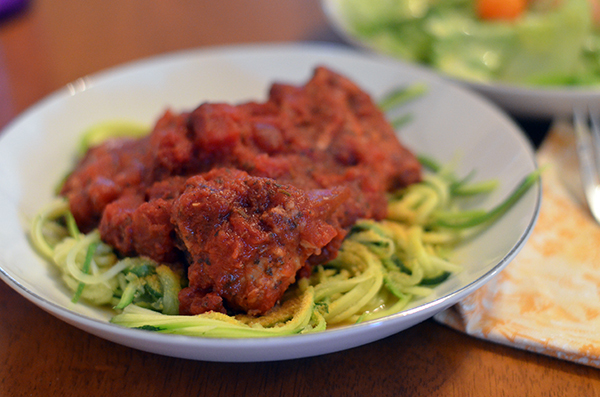 Serve as-is or with noodles/zoodles. Try adding italian bread crumbs about 1/4 cup they stay and mold better. Or if you are trying healthier go with whole wheat panko brad crumbs. You cant tell they are in there! Made this tonight, and it rocked! I used ground turkey instead of chicken and cooked it for 3.5 hours on high instead of 6 on low. My plops held together very well! (Ewwwwww!) This will be a frequent flyer at our house. 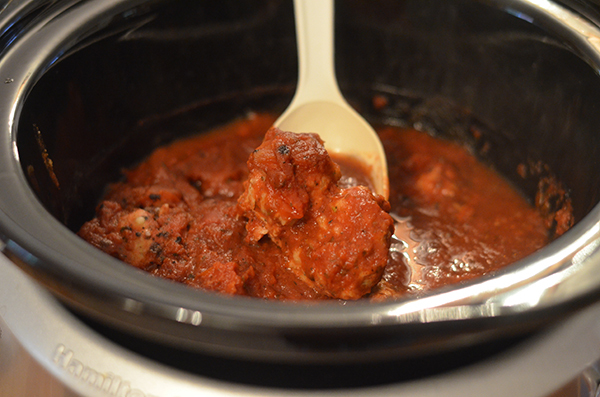 Your Chicken Meatballs, look delicious, great coming from the crockpot. Thank you so much for sharing with Full Plate Thursday and have a fun weekend! This rocks! I love my Crock Pot! You are so fun! I wish I was your next door neighbor. Will try this dish soon! You love your kitchen, lists, and made-up words!!! I truly do believe we were separated at birth! Thanks for another great recipe. It’s in the PTE lineup for next week! 🙂 You make me grin. Back at’cha! Have a great weekend. Thanks for making me laugh several times! Love it!! About your garlic going moldy in the fridge, why don’t you freeze it? We buy up a whole big bunch of it, stuff it into a bag, and freeze it. It stays good for a long time. You love kitchens, lists, and making up new words! I really do think we were separated at birth! Thanks for another great recipe! I’ve not done many (any?) intentionally FP meals, but this one may go into PTE as I lose my last few pounds to goal weight! Making up words is super duper fun! Oh my god you definitely had me laughing on this post. I love crock pots and I am going to try this recipe! What kind of noodleizer do you use? It’s in the post where I linked the Zoodles. I like it a lot! Oh my goodness, you are extra funny today! Thanks for being a bright spot in my day! The world needs more “clean” humor like yours! I love dehydrated garlic, too. It’s so versatile! I even use it to make my own garlic powder by grinding it in the spice grinder. I always find that the store bought garlic powder clumps up too much then I end up throwing it away. When I make my own in small batches, it doesn’t clump. Hi Stacy! How did you make those squoodles and zoodles? We would love to try some different noodles options around here. 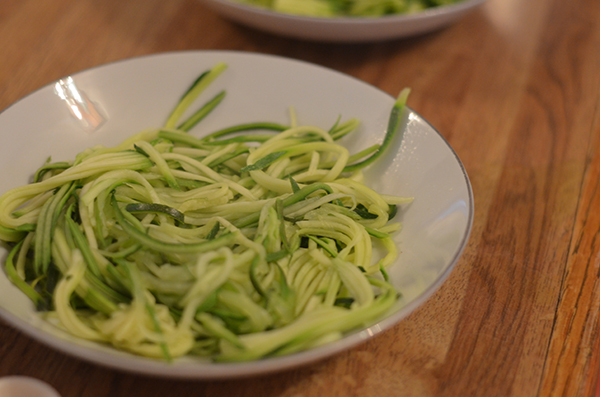 Can you please share how you make the zoodles or squoodles? Trying to get more gluten out of my diet and this sounds like a good replacement.